Sprog the Younger is a junior in high school, which means Spring Break was for the two of us to do The College Tour, New England Division. Being primed by Tolkien to look at landscape, I’m constantly disappointed because most books don’t give me that sense of physical setting at a more-than-human scale. The only exception I found in a haphazard walk through the literary canon was Thomas Hardy. Movies and TV are much worse. Literature may fail to describe landscape, but movies and TV show you a landscape that doesn't correspond to the stated setting, and which moves around capriciously. I think that by watching movies and TV, we get used to landscape not meaning anything, they train our vision to be sloppy. So I'm trying to train my vision to be *not* sloppy, to see what's out there beyond the shoulders of the highway. These are my notes. Google Map with Terrain, showing our route on the first leg of our trip. I've removed our route inside NJ. Click for full version, 609x950px. Very large Google Satellite view of the first leg. Click for full version, 1176x1965 (1.7Mb). The first leg was from NJ up to Cornell, which I’d never visited before. We crossed the Delaware River on I-78, then up US-33 through Wind Gap to the Poconos. Spring is much less advanced than down in NJ, where we’re starting to see daffodils, and we were surprised to see how *dry* everything looked. There was no greenish haze starting in the grass, everything was sere, brown or yellow. Kind of creepy, considering how green and wet things are in NJ right now. I hadn’t realized that the Poconos are a Plateau as well as hills. The landscape actually reminded me a good deal of the Pine Barrens, with stunted or half-grown trees. Aha, I see we drove in the Tannersville Bog region, that’s why it was reminding me of the Pines. Further on, we saw several ponds with beaver lodges in them, and one with an Osprey. Schematic picture of the Northeast Appalachians, showing the mountains where we travelled. Created by a Wikipedia user. We continued up onto the Allegheny Plateau, and Sprog was shocked by the depth of rural poverty visible from the road. Almost every farm made me think of the word “hardscrabble”, unlike our part of NJ where farms are packed full of corn, vegetables, and smug-looking livestock or even horses. We discussed it, and I said that I thought the difference is that the land in central NJ is so valuable -- for houses, industry, or commerce– that rural poverty is almost impossible: if you have land, you can’t be too poor. We have to have a substantial Farmland Preservation Program for there to be farms *at all* in central NJ, so the farms we do see are rich (in the sense of fecund), if not wealthy. NJ poverty is in the cities; "mobile homes" and other manufactured housing are uncommon, but we saw a *lot* of them as we drove through the Poconos and even more on the Allegheny Plateau. And, in the US as it is today, as soon as you hit areas of white rural poverty, there are big military recruitment billboards. Sprog even noticed a Romney yard sign, which is either *real* determination or bitter despair. We had started to see birch groves and spruce trees mixed in with hardwoods almost as soon as we left NJ, signs of a more northern habitat. Now I saw occasional hemlock trees – including some that had clearly been killed by adelgid bug infestation, which is devastating American Hemlocks. In due course we turned west on NY 79 to Ithaca. We passed through Lisle and noticed the high dike protecting the village, and the wide, unbuilt floodplain. The ground still seemed pretty dry for the season, but it’s clear that the stream is no respecter of human interests. But driving up the valley was very beautiful, and the narrow valley, steep hills, and rushing stream reminded me of traveling in eastern France and Switzerland when I was young. Except the Swiss don’t tolerate the kind of run-down poverty we were seeing. Tolkien’s own picture of Rivendell. Cornell on the hill, by Duyi Han. Edinburgh Castle, enveloped by an early morning haar, as seen from the Princes Mall. From Wikimedia Commons. Of Cornell, I’ll only say that students must get used to going uphill both ways for *everything*. Sprog found it kind of cold and gray, which no-one can deny is a fair cop. It’s also awfully exposed to wind on the hill there, but damn, the views are magnificent. And when we saw “Library Slope” we both immediately thought of snagging a cardboard box or a cafeteria tray and going for a slide. Oddly, I can't find any online pictures of such activity, so I guess Campus Security frowns on it remarkably effectively. I started actively noticing landscape a lot more the first time I moved coasts. I had grown up and gone to school in the Northeast, and certain things hold true no matter where you are. Suddenly everything I took for granted in the environment was different - I didn't even *recognize* a lot of the vegetation, the geology was a lot different,and water....water was *really* different. I haven't been back to Ithaca in a decade or two, so I imagine it's changed a lot. But Cornell has a beautiful campus. Once the spring hits, it's amazing, and I actually loved it in the winter. You do get used to the hills and the walking. As far as it being grey, well, there was a joke when I was there that Ithaca has two seasons: winter and July 4th. Though the amount of time I spent napping in the sun on the quad would contradict that. Cornell winters certainly are gray, but it doesn't last the whole year. When I went, I always treasured returning to campus from the long weekend of Fall Break -- the foliage was breathtaking. Road trips are a big part of my life. I grew up in a camping family and we spent as much as three months of the year roaming around the West mostly, camping. Howeer it wasn't until I went on a cross-continent bike trip that I really became aware of travel as movement through geography. Those blue highways we biked on nearly always followed water eithr up hill to the the pass or down the other side. Sometimes the grade was long and steep, other times, barely discernable, but nearly always the road followed water. My other experiences with travel-as-a-lesson-in-geopgraphy are my many trips to the mindboggling beauty of Utah where georgraphy is so stunningly lovely and weird that it induces a better high than any recreational drug I know of. I recall this tribute to the geography at Cornell (from back in the 1950s or 1960s, when such comments were acceptable): "You can always tell an Ithaca co-ed -- great legs." And about the rural poverty...my husband and I went Ireland several years ago and, well, it affect how the US looks to me. We stayed in a market tow called Dungarven, drove across the country and stayed on the far sie of the Dingle Peninsula, drove across the coutry again and stayed briefly in Dublin. I'm sure there is poverty somewhere in Ireland, but we never saw it. We sawq lots and lots of comfortable housing and people who looked busy ad healthy. Then we came back to the US to the land of rundown trailers, unpainted houses, people who look both unhealthy and unhappy. It was a shock. Geography + Road trips = heaven. Like Laura I grew up traveling. When I was 6 or 7 my dad handed me a map and said "here, you're now the navigator." and I was hooked. I look forward to one day road-tripping in the Northeast - I've been to almost every state west and south of there. Poor, rural - so many places where there are forgotten people in this country. I was going to say I think they are better off than the poor in places like China or El Salvador, but I am not sure that's the case. The ones here are so much closer to the "American dream" and its obviously so unattainable. At least the poor in other countries can dream that if they make it to the US they'll have it made. Argo beat me to it, but yes, traying on Libe Slope at Cornell is a generations-old tradition. And the weather can be awful, but the views--and the sunsets--are magnificent, as are the libraries. And the food! Much better food than most universities, because of the Agriculture school (where they produce their own dairy goods) and the Hotel school. ObligatorySFF reference: Matt Ruff's Fool on the Hill would have convinced me to go to Cornell, if it had been written before 1982 (he actually was a year behind me). I used to have a travelling buddy...he's dead now, but my life is enriched by the memory of our trips. He didn't much care about destiination. The trips usually had soome sort of theme like travel by bike or tour of places in Bernard De Voto's Across the Wide Missouri. Once we set out to drive around colorado by dirt road or blue highway, literallly around, the rule was to not cross the border into Colorado. I've been to all sorts of obscure places in Whyoming. Most of the time we read books to give a historical counterpoint to the landscape so i am well up on fur traders, exploeres and traditional Native cultures. My memory is full of snapshots. Thank you, old dear friend. I used to drive part of that route about once a week when I worked at Ginna outside of Rochester, traveling between there and home in South Jersey. My route, after going through or around Philadelphia, depending on the traffic situation, was via I-476, meeting I-87 at Clark's Summit. I recall the stretch from just a bit north of Binghamton to just a bit south of Syracuse to be the most beautiful part of the drive. I also recall billboards advertising the availability of cheap cigarettes on Indian reservations, which I always found depressing. I also remember being surprised the first time I drove home on a Friday afternoon, hitting Syracuse right around rush hour, at how little traffic there was going through Syracuse. It's a visually stimulating town to drive through, with lots of cool, older buildings to look at, but it's sort of empty feeling - abandoned, even. 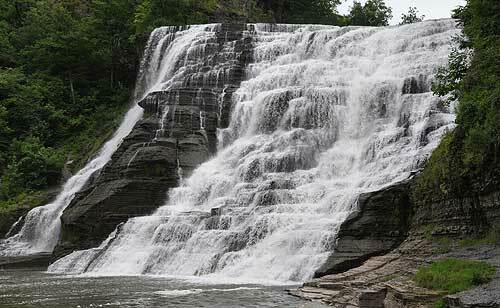 there are lots of falls in and around Cornell. but they're not all clustered together. i'm super jealous of your trip. that's my home turf: north-central PA, southern-tier NY, then east to the the Adirondack foothills. love all those old worn-down mountains. a few years ago, wife and i spent a week driving around up there. we started in Buffalo (for a wedding), so we did Niagara. then over to the awesome Rochester, south to Ithaca, then to Corning NY and Wellsboro PA (PA Grand Canyon). finally, up to Syracuse. gorgeous scenery everywhere. was surprised to see all the wind turbines in the finger lakes region. that was new to me. rural poverty? hell yeah. it's why i get exasperated when northers make fun of the south for being poor and backwards. sheeee-it. rural poverty is everywhere. White County, IN is lousy with wind farms. You can drive down I-65 between Indianapolis and Chicago, cross into White County, IN and all of a sudden there's windmills everywhere. Who knew? Wikipedia, for one. I am a big city kid* (and a walled-in one for the first 16 years since it was and still is West Berlin). The landscape outside the city is imo one of the most boring the country has to offer**. Our traditional vacation destination is Norway where landscape is in over-supply. But the trip there by car is always very straining*** (first the North German plains then Denmark). What I'd wish for is that the cellar backdoor would lead directly to a nice place in middle Norway. Norway is one of the few places I'd be willing to relocate to, and the landscape is a significant part of that. The natives are also nice ;-). there's a band from the Ithaca area called "The Horse Flies". they have a song called I Live Where It's Gray. But the trip there by car is always very straining*** (first the North German plains then Denmark). Oh Hartmut, that's *adorable*. You have no idea about long and monotonous. Fellow USans, which do you think is worse: going through Kansas the long way? Or going through Nebraska? There is a difference between a monotony that allows the mind to wander and one where one still has to be on the alert constantly. No 'wake me when we cross the next state border'. My American experience is limited to a motorhome trip from Edmonton to Vancouver more than 30 years ago, years before I even learned my first word of English. Well you have to stop in both states, which were part of my summer 2011 road trip from Texas to Washington state by way of Mt Rushmore. Kansas has the Cosmosphere, in Hutchinson, the most awesome Space Flight museum ever. They have the Apollo 13 capsule, among their many artifacts. There's also the Marland Mansion in Ponca City - a tribute to the oil boom. Nebraska has North Platte, where you'll find the confluence of the N and S Platte rivers, a Pony Express stop, a Meeker marker, a Lincoln highway marker, and a Carnegie library. It was the jumping-off point for folks going to Denver, and a major crossing point on the Oregon Trail. Although driving thru both states without stopping is the norm, there's plenty to see. and I forgot about the largest rail classification yard in the world -Bailey Yard, in North Platte. Several years ago my wife and I in an RV followed the trek (via diary) of an 1850's family on the Oregon trail from Indiana to Idaho and then the California trail to Sacramento. The highways, blue & Interstate, still follow water. Coming from western PA, the memory of the plains and then the mountains still stuns. Geography dictated the route then and now. It also embodied the hardships where water and grazing were paramount. I rode a bicycle across Nebraska, highway twelve, the raod across the north of the state. It's actually quite pretty. Ad there's lots of historical stuff along the way. I recommend the Roadside Geology books as a complement to any blue-highways road trip. Reading Leopold's Sand County Almanac helps one to see landscapes as processes, rather than scenery. For Western trips, John McPhee's Rising From The Plains and Basin and Range will give you plenty to think about. Finally, the gorgeous Raven Maps and Images maps of the US States and of the contiguous 48 as a whole are, for me, endlessly fascinating. My memory of driving across Nebraska (I-80) was hundreds of miles of standing waves of land -- all green grasses, and no trees or buildings in sight. I suppose that's less dull than just flat, but not much. Definitely fit Hartmut's description of driving on autopilot. Thank you so much for the link to Roadside Geology! I've never heard of the series before, but this is *exactly* what I was looking for -- we kept driving through cuttings and wondering about the exposed rocks. And the New Jersey volume is just about to come out! Yes, to Sand County Almanac. Mari Sandoz's books also are a good accompaniment to Nebraska.